It’s been almost two weeks since I posted last, which I absolutely HATE. The problem is that the last two weeks have almost been survival mode. Two weeks ago I got sick and was down for about 3 days. When I say sick, I mean on the toilet every hour kind of sick and we will leave it at that. I rallied for a short while and felt really great to be able to go to clinical last week only to be up all night last Monday night. It was horrible. I could barely eat and just barely made it to my lecture class the following Tuesday. Luckily I was able to get through it and put it behind me but that put me behind on my studying, housework, and everything else. Last week I also had tests, both in Med-Surg and Chemistry, which were no fun and took up a crazy amount of time studying. I’m also taking an advanced Physiology class, which is also a time sucker, more than I can say. So that was everything I was dealing with. While I was sick Livi also was down with her belly and last weekend Aiden got a fever and wasn’t feeling fabulous. Then on Friday I got a call from my SIL saying that when she dropped off Aiden at pre-school and went to leave his right eye was red and swollen all of the sudden. Apparently pinkeye has been making it’s way around school so I definitely didn’t like the sound of that. Being that I don’t particularly like taking the kids to the doctor for everything little thing and that I try to avoid antibiotics when possible, I did some research before calling the doctor’s office. Everything I found said that pinkeye (or conjunctivitis for my medically inclined readers out there) is most commonly caused by a virus. We decided to treat with ibuprofen for the swelling and lubricant eye drops for the redness and itching. By the end of the night last night his left eye was just as red and irritated looking. Luckily tonight his right eye looks almost completely clear and so far no one else in the house has come down with the same symptoms. I’m probably jinxing us by saying that but I’m still putting it out there. So the last two weeks have included far too much eating out, far too little blogging, and just getting by. Since you are sticking around with me I will share pictures of the people that have been working on surviving with me. 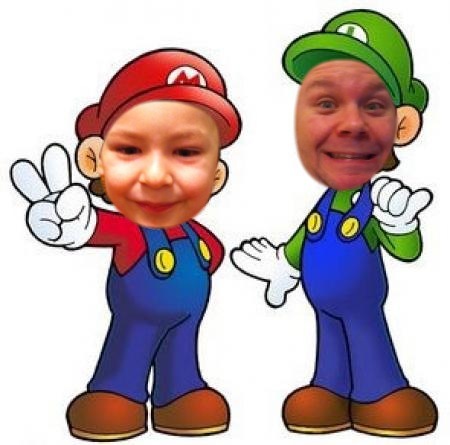 Our friend Dusty has a fun app on his phone that did these pics, which of course the kiddos loved. You can see Aiden’s poor swollen left eye. And my silly husband who will do anything for a laugh. Sometimes survival is something to be thankful for and know that you can get back on track in short order. Survival isn’t so bad sometimes. Gabe and I have never really done much for Valentine’s Day. It just hasn’t been that big of a deal around our house. Even when we dated it seemed like a lot of trouble to spend too much on flowers that are substantially cheaper on other days of the year or go to dinner in a restaurant that’s packed when most nights you could sit right down. That’s a lot of work. Why not show the person that you love just how much you care throughout the rest of the year? Flowers seem to mean just a little bit more when they come for no reason than as a half to. 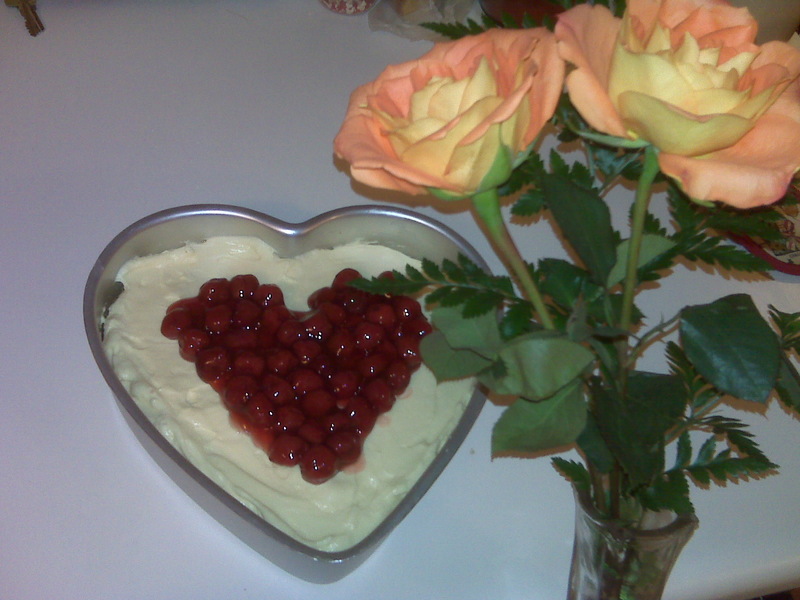 This year I decided to make a quick, no-bake cheesecake because Gabe said it sounded good and it seemed like just the right time to break out the heart shaped pan. The flowers were something free I happened upon and that’s pretty much the celebration of our Valentine’s Day. And I couldn’t be more happy about it. 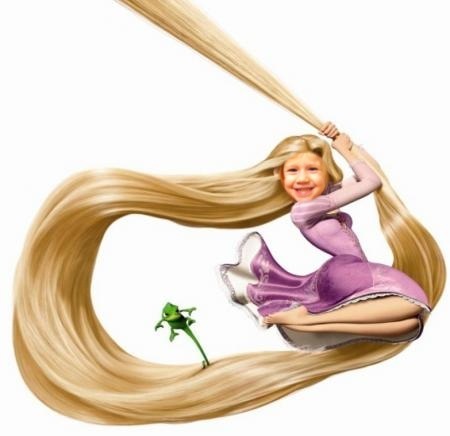 I have long hair. Okay, so I have REALLY long hair. In the shower my hair brushes the backs of my calves. That makes it difficult sometimes to be able to have multiple and varied hairstyles. Usually I end up wearing my hair in a bun (especially during my clinical rotations as a student nurse) or maybe a French braid or something along those lines. When I’m feeling like doing something different I will “scrunch” it with some gel and mousse and go for a messy curl look and wear it down. And really, those looks are getting OLD. 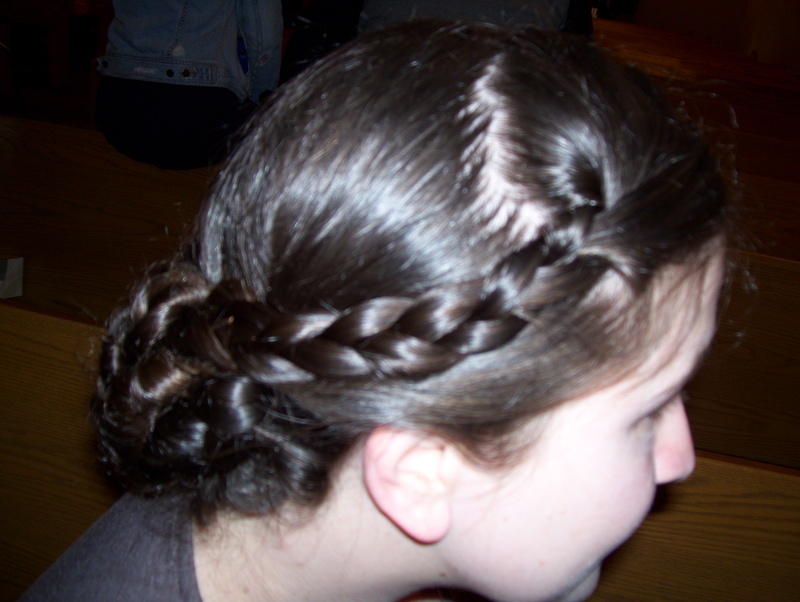 I try to do a few different things for going out, like braids for accents when it’s up or curling it in a fancier way. I have found many different styles through the use of YouTube. There are some awesomely creative people that have put some really neat styles on there. Here’s the problem though, I have REALLY long hair. There are some styles for really long hair but a lot of them are things I already do or that I’m just not interested in trying. Last night I was looking around and found some cute things that aren’t designed for super long hair but I thought I might be able to make work with a few tweeks. I only know the poster as “LetsMakeItUp1” (I think her name may be Kaley but please don’t hold me to that!) but she has some GREAT videos. One of the videos includes 5 styles for wet hair in under 10 minutes. Check out the video here. The style I decided to try first was the first one with multiple braids that were knotted and pinned up in a sort of pseudo bun on the back of the head. Of course I had to make a few modifications because her hair, while longer, is still considerably shorter than mine. I figured I would show you my finished product and how I made it work. 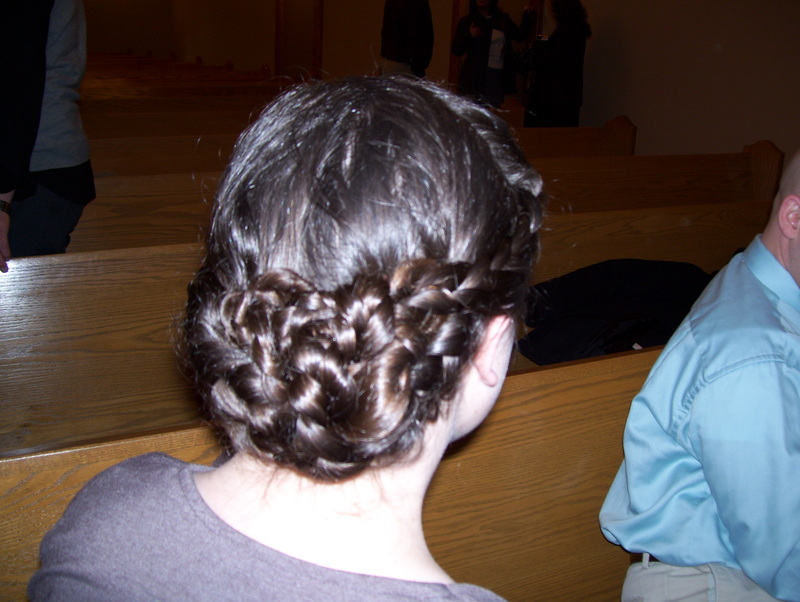 This is my hair at church this morning from behind. It’s got that little bit of messiness I was looking for when I put it up. I used very little hairspray once I got everything pinned in to place. This is the side view. 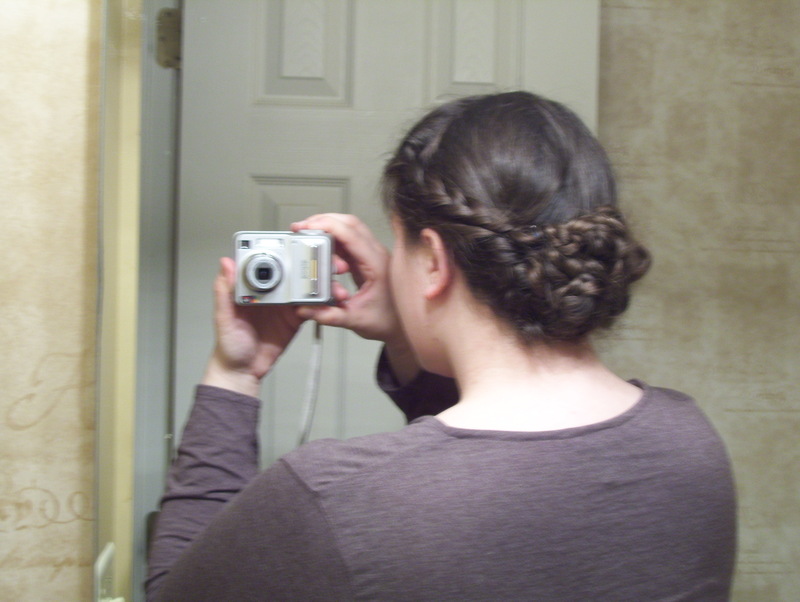 It’s a little out of focus but I think it still easily shows how pretty the side braid ended up looking. Of course I couldn’t do the style exactly the same way it was done in the video but the basics are the same. I made a top/side braid and divided my hair into two sections in the back and also braided them. I had to make some modifications from there. 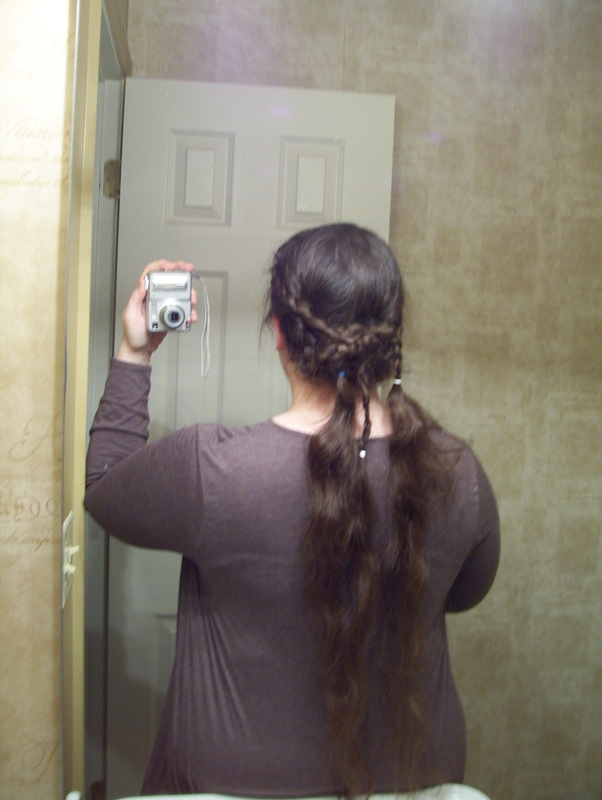 First, I only braided my hair about half way down (maybe even a little less than that). Sorry for the fuzzy look of my hair. This is actually after I took my hair down in the afternoon so it’s not real smooth looking. I think this pic shows the length and change I made though. Even braided you can see how long my hair is and you can see that I tied off the braids fairly high up. 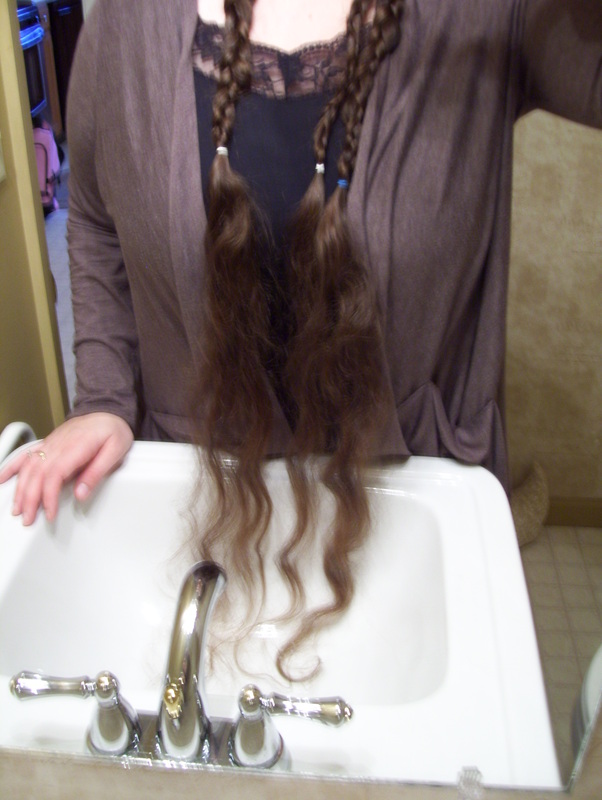 Then I changed a few things about how I tied off my braids, given the length I was dealing with. First I tied the two back pieces, then I added in the front piece. I alternated tying the side piece with the back pieces until there was just a little bit of braided hair still hanging out with the loose hair still hanging out. You can see the hair ties still hanging out of the knotted braid portions of my hair. That’s where I modified the hairstyle again. I took each of the three pieces, one at a time, and rolled them on two fingers up to the tied off portion. That’s when I then tucked that part under the braided/knotted areas and hid the unbraided portions of hair. I pinned everything in place and that’s how I was able to only braid part while still getting a very similar look. I think I could easily dress this up with a neat flower hair pin or hair ornament or wear it casually any day I’m out and about. It looks fancy enough to give the impression I’ve put work in to it but not so fancy that it would feel strange for every day. I can also see myself trying multiple styles on that video I referenced earlier also. Have you found neat hairstyle ideas online? If so, where? I’m obviously open to neat, new ideas! Last week my first Simply Thankful Saturday had a serious note to it. It’s nice to be serious sometimes and talk about the amazing blessings in my life. Other times it’s nice to talk about something completely silly that I’m lucky enough to have access to. Today that’s coffee. I love coffee. Wait, let me take that back. I LOVE coffee. It makes me happy when I get up in the morning and I go to start the coffeemaker only to smell the aroma of the coffee when I open the container. A little creamer and a sweet n’ low make it just right. I am even happier when I get the chance to go to Starbuck’s and get that awesomely hot cup of coffee with the perfect mix of espresso, mocha, and sugar free vanilla syrup. 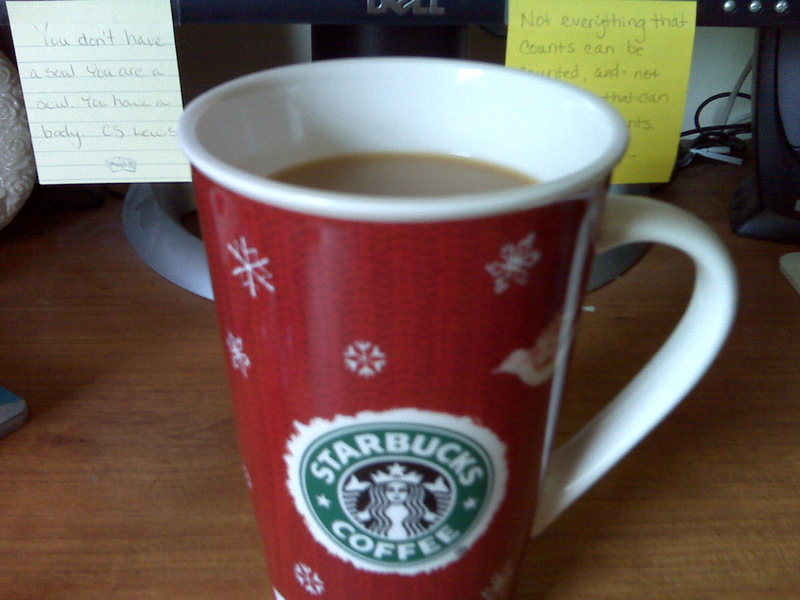 It may seem silly to some people but I’m thankful that something as simple as coffee can make my day a little better. There have been plenty of looks throughout the years that have easily fit in to a modest lifestyle. The looks of the 40’s and 50’s have made quite the comeback lately, and for an hourglass shape such as myself, it’s a GOOD thing! How could you possibly go wrong with something like this? Not only is it a GORGEOUS color, but it has a perfect shape, emphasizing the great curves ladies have, while still keeping just enough covered to be appropriate for work, evening, just about any time. Retro fashion is definitely my friend. Yesterday I saw a quote that I haven’t been able to get out of my head. Actually, it was on a fortune cookie of all things, but it stuck with me. How profound is that? Too many times I worry about starting something because I have fear. I don’t want to fail. I don’t want to quit and not accomplish something. You know what that leads to? Not trying anything. That doesn’t help anyone and doesn’t get any of us anywhere. I’m scared to death of not completing a goal this year that I’ve put out there for myself, completing a half marathon. It’s easy for me to use fear as a crutch and an excuse to stop me from doing something great. It was fear that made me believe I couldn’t question my place in the nursing program, not being accepted into the ASN but rather the lower PN program. It was faith in myself and the hard work I had achieved, along with the awesome scores I posted, that made me ask for my scores to be reevaluated. It was the knowledge that I worked hard and deserved to be heard that made me go back a second time, even with the dean looked at me like I was insane, and tell her something just wasn’t right. It was not listening to the fear that was ever present in the back of my mind that was telling me not to question, not to put myself out there, that made it possible for my scores to be reevaluated, for the mistake to be found, and for me to be placed into the ASN program in the spot that I earned (and receive an apology from the dean for the mistake being made in the first place). Had I not had that faith in myself I would still be in the PN program (which is completely OK!) but it would have taken me an additional year to complete my course work and be able to become a registered nurse, which is where I want to be. That’s a big price to pay (time and tuition) to let fear have a place in my life and it’s not worth it. Shadows are okay because it means a light is shining and I’m ready to run to that light.